In the promotional product industry we often use different logos for different types of decorations on product such as pens, hats, bags etc. Embroidery, laser engraving, screen printing, pad printing, digital printing... the list is endless. But what type of logo do you need to supply to Silveradoh to ensure we can decorate your product? JPG (pronounced jay-peg) images are often used in workplaces for general everyday documents such as in letterheads and email signatures. However, when these are looked at closely they are pixilated and blurry and often sometimes barely legible. Vector files often saved as an EPS are created using a series of curves, shapes and lines in graphic design software such as Adobe Illustrator or Correl Draw. Whether your logo is scaled smaller than a 5 cent piece or blown up as big as a building, the image will always look crisp and sharp. Vector images are required for all types of decorating on your chosen product. You may need to ask your marketing department or the company graphic designer for the Vector version of your logo. 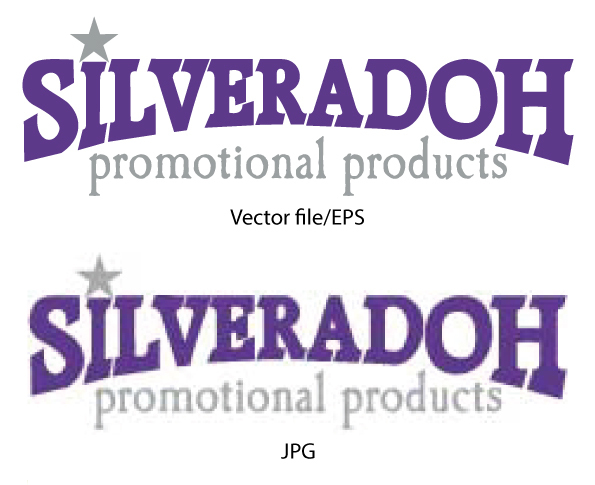 If you are unable to get the original Vector version of your logo, Silveradoh are here to help! If necessary, we can re-draw a logo from a JPG.